Who doesn't love a good cocktail, amiright? 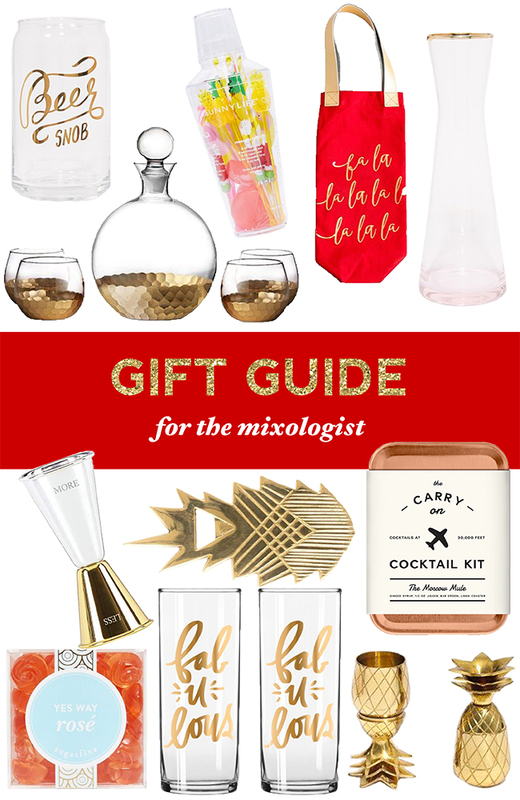 Or, you know, at least a cute glass to drink out of ;) But seriously, gifts that relate to drinking are perfect for coworkers, gift exchanges, or when you're looking for something to bring to a dinner party in addition to a bottle of wine. Yes way, rose! One of my favorite things about the holidays is getting to wear festive holiday clothes for a month straight. My closet is currently bursting to the seams with red plaid just waiting to be worn. I picked up this shirt earlier this month and have been basically wearing it nonstop. Plaid and ruffles, what's not to love? Linking up with Flashback Friday, Friday Fab Favorites, Style Me Wednesday, Confident Twosday, How I Fall. ...Kept telling people I didn't do any Black Friday shopping, and then realized I had actually made quite a few purchases, like two pretty lip gloss sets that somehow already sold out, a comfy cardigan, and these fun tassel earrings. Whoops. I did manage to pick up a few presents for people other than myself though, so I'm considering it a win. ...Drove up to my sister's house for an afternoon of painting (I'll show you what I made on Snapchat! Find me @kristinadoes) and binging the Gilmore Girls. Did you catch the new season yet? I think they managed to squeeze all of the truly awkward scenes into the previews so my expectations were pretty low, but the season itself was everything I could have hoped for - funny, perfectly nostalgic and lots of Kirk doing weird things. And now, if you'll excuse me, I'm going to go rewatch it 800 times. ...Did a little more painting at our house, except this time on the walls. We had some work done last month on our windows and had a big patch that needed to be covered. I've somehow made it this far in life and never painted a wall before, and now, having painted at least eight square feet, I don't think I ever will! Oh hey there! A Black Friday post say whaaaaat?! I'm surprised myself that I managed to pull something together considering yesterday I was fully committed to family and red wine. J.Crew - 40% off your entire purchase with code HOLIDAY. This is crazy because J.Crew never goes higher than 30% off for their sales! It's the perfect time to pick up some of that holiday plaid. J.Crew Factory - 50-60% off everything (no code needed), plus an extra 40% off sale with code HAPPYSALE. LOFT - 50% off everything with code FRIYAY. Banana Republic - 50% off up to 5 full-priced items with code BRFIVE. Ann Taylor - 50% off everything with code CELEBRATE. So tell me, are you doing a lot of shopping this weekend? What's on your list? Oh hey, Happy Thanksgiving! What are you thankful for? I'm thankful for getting the chance to do what I love every day, my husband of a year and a half now (!!!! ), and boatloads of gravy, of course. Today I'm stepping away from the computer for a whole lot of family time. I haven't decided yet whether I'll be back this weekend with some sale picks for the big shopping weekend or not. Either way, I hope you have a very happy Thanksgiving, and I'll be back on Monday with my regularly scheduled content! 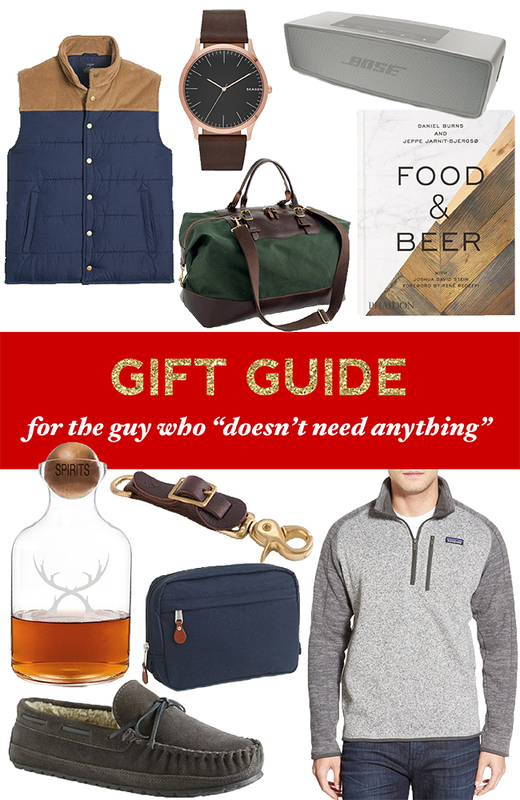 Gift Guide for the Guy Who "Doesn't Need Anything"
I always have a hard time shopping for the men in my life, mostly because they always say they don't need or want anything! Seriously, the closest my dad has gotten to telling me what he wants for Christmas is, "maybe some tools," which led me to the gift card section at the Home Depot. Very creative. Jeff rarely gives me any ideas either, but has generally loved the gifts I've given him. I got him a little Bose speaker for his birthday last year, and he loved it so much we ended up buying a second one to keep in the kitchen. I've always thought certain "man gifts" were lame, like dopp kits, but it turns out that they're that thing your boyfriend or husband will never think to buy for himself but will love and use all the time. Sole Society has been having a crazy sale specifically on this wrap for the past couple of weeks, and after the first couple of emails about it I of course needed it. I'm so glad I decided to push buy, because it is so soft and cozy, and the plaid feels festive but will also be great after the holiday season. Plus, I'm wearing it as a wrap here but it can also be worn as a scarf. Win win win. Speaking of Thanksgiving, what are you up to? I'm used to having a pretty intense Thanksgiving weekend thanks to my family historically trying to cram in as many activities into four days as possible. Growing up, we would hit one or possibly two grandparents' houses for the big day. Then on Friday, we would head into Chicago with the extended family for our annual "Christmas Walk," which when we were little meant lunch and shopping and looking at the pretty decorations, and as we got older mostly meant hanging out in a bar all afternoon. Then on Saturday we would drive three hours each direction with a bunch of family friends to cut down a Christmas tree from my cousin's farm, and then rush home to get ready for a fancy Christmas party at my Grandma's house that night. Whew, I get exhausted just thinking about it! These days we've cut out some of the activities, although the "Christmas Walk" bar hang is still in effect. Lately Jeff and I have been trying to squeeze two Turkey dinners into the big day though. His dad's family has their dinner around noon every year, and then his mom serves dinner later that night, giving us enough time to sneak in a turkey-filled nap between servings of mashed potatoes. It's crazy and exhausting and delicious, and I can't wait! Oh, and sidebar, can we talk about these flats? Did I need a pair of flats with bows that are covered in glitter? Um, of course! They aren't super comfy, like I wouldn't walk miles in them, but for a little sparkle toe I'm willing to work with them. They're going to be the perfect party shoe this holiday season! 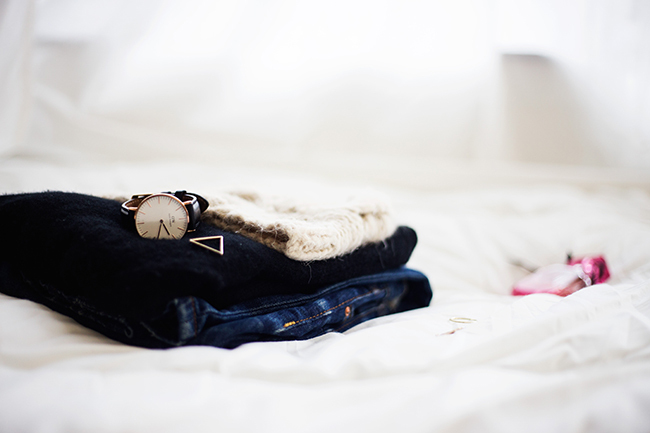 Linking up with Trend Spin Linkup, Style Me Wednesday, Style Sessions. ...Spontaneously met up with my sister to catch a movie. We saw The Edge of Seventeen, and while I wouldn't say it was the best movie, I was thoroughly amused. Plus, you know, popcorn. ...Did a whole lot of shopping and didn't buy anything besides 15 sheet masks from Target. Le sigh. I guess I'm just not built for visiting malls anymore, I get so impatient! ...Decorated our Christmas tree! Shhhh, I know that it's Thanksgiving this week, but we're hosting a little holiday party in a week and a half so we wanted to get a jump on things. Plus, you know, who doesn't like having a tree all decorated and lit up in their house?! ...Met up with a friend for drinks at Gilt Bar. I haven't been in years, and was pleased to discover it's just as cute as ever. Plus, half of their cocktails seem to have prosecco in them, which is never a bad thing in my book. ...Celebrated our one year anniversary in our condo! Right when we moved in the heat didn't work, and the condo decided to celebrate our anniversary with us by breaking the thermostat again! As I type this, I'm currently wrapped in a blanket scarf and under a faux fur blanket. The first year of homeownership has been a little challenging (just about everything has needed to be fixed!) but so worth it - I still love our place! 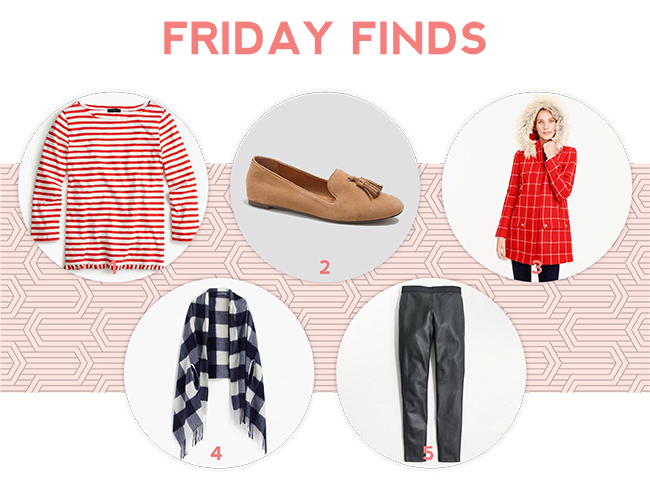 Apparently we're in a J.Crew/Factory heavy week ;) What can I say, I want it all. There are some days that you just want to be cozy, amiright? Last weekend we went to a Friendsgiving party, and with all of the turkey and mashed potatoes coming my way, I decided the comfier, the better. Leggings? Check. Oversized sweater? Check. Gigantic scarf that I could wrap around myself and wear as a dress if I wanted? Double check. This was somehow the first time I've worn this scarf since I got it, and you guys, it is the perfect blanket scarf. Not too crazy huge, and super soft. For the real deal next week, I'll probably be wearing something really similar. I've always wished our family Thanksgivings were a little dressier, you know, so I'd have an excuse to wear my heels and dresses, but alas, we always go super casual. Also, if I try dressing up at all my sister gets mad at me. You should have seen her reaction when I ignored her "tee-shirts only" packing request for our family vacation this summer. She takes her comfortable dressing seriously. What will you be wearing for Thanksgiving next week? Are you going dressy, or is comfort king? Linking up with Mix It Monday, Flashback Friday, Friday Fab Favorites, What I Wore to Work. 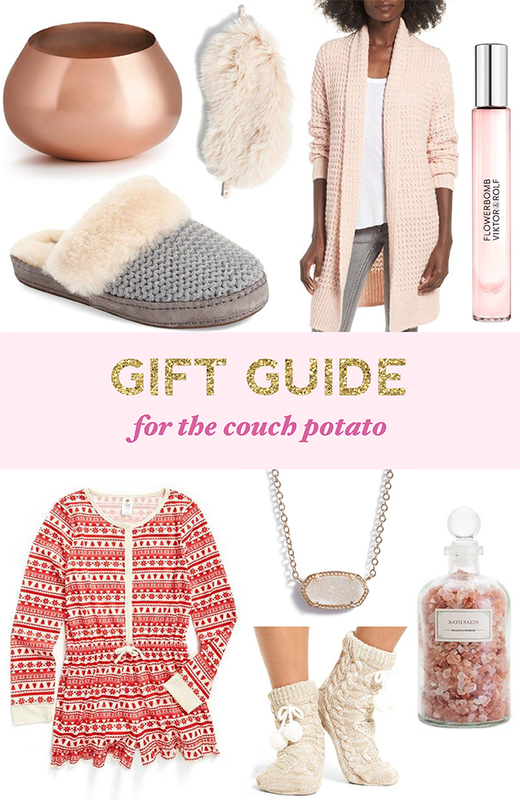 You guys, is it really time for gift guides already?! I actually bought my first gift of the year this week (!!!) so yeah, I guess it is! I've shied away from doing a ton of gift guides in the past because there are so many out there, but they're actually some of my favorite things to read so this year I decided to go for it! If I'm properly motivated, you can expect a gift guide for a different important person in your life every Wednesday through Christmas. So, let's start with the very most important person: the couch potato. Okay, so how did we get to halfway through November!? I'm not mad about it or anything, I'm just wondering how we got here. The main benefit of this time of year is it's red plaid season!! I got this ruffled collar plaid shirt in the mail last week and was so excited I had to immediately put it on my body. I've maybe worn it three times in the last week. Don't judge me. Seriously though, if you're starting to think about what you might wear to all of your holiday events, this. shirt. is. it. I mean, it's red. Check. It's plaid. Check. And it has a super adorable ruffle detail. Check. 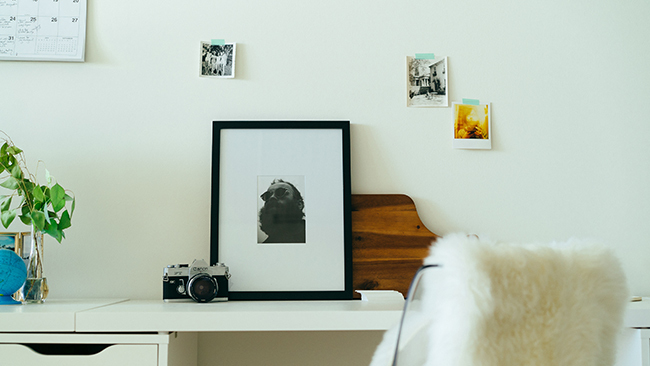 I love it layered here, but it really works well on it's own too (stay tuned for that!) If you're thinking about adding it into your closet I suggest doing it NOW because A) it's so adorable, B) it's currently on sale, and C) some sizes are already sold out so it's going fast! I'm not sure I necessarily needed this one in my closet though, because it is literally exploding with red plaid button-downs at this point. I'm not really sure what I'm going to do with myself come January, but I definitely know what I'll be wearing until then. Linking up with Style Me Wednesday, Style Sessions, Confident Twosday.